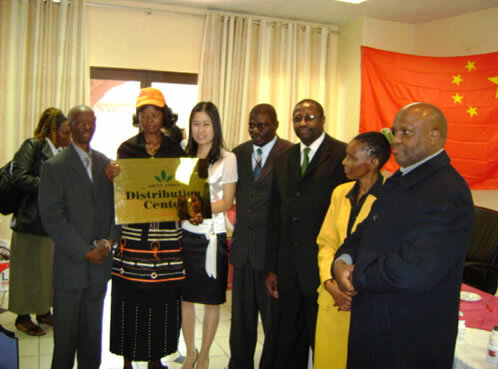 On the 13th September, 2008, another Green World distribution Center was launched in the city of Palabye of Botswana. Miss Daphne Y. Wu, Green World Africa top management, Mr. Eric Phofu , marketing director, together with Mr. Peter Boroko, a top marketing leader attended the function, They were also joined by the Local Chief, Mr. Thebe Monyepele, the Local School Principals and Brigade Coordinator Mr. Cornelius Mathlare. Over 100 top leaders also attended the meeting at the invitation of Green World Africa. During the meeting, Daphne Wu delivered a speech on behalf of the company, and Marketing Director Eric Phofu elaborated on the marketing strategy of Green World Africa. While Green World senior Lecturer Mr. Peter Boroko delivered a presentation on Green World products and compensation plan. 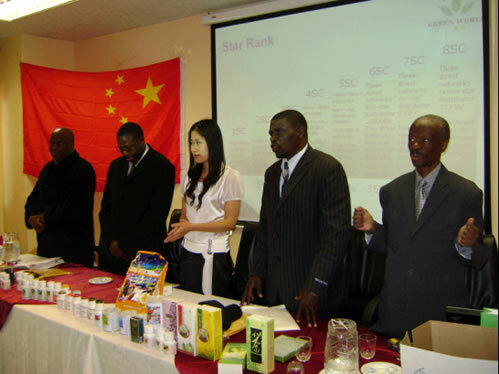 Miss Wu, also sang high praise for the great achievements attained by the top leader MAYCE MATSHAMEKO, who, together with her committed team, spread the Green World business to all parts of Botswana and its neighboring countries, and currently, we have got a marketing team of over 2,000 in Botswana, among whom, we have 2 six-star distributors and dozens of five-star distributors. The top producers were also recognized with fast-growth award at the function. All the attendance was greatly motivated and they were more determined to work hand-in-hand with Green World and bring the Green World business opportunity and Green World products to more people.